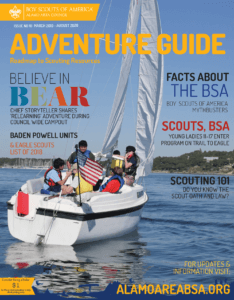 The Boy Scouts of America’s (BSA) new online member registration system offers prospective members and adult leaders an easy and convenient way to join Scouting! From completing the application and making payment, to authorizing background checks, the process is accessible from any PC, laptop, or mobile device. Parents with youth interested in Scouting can visit www.BeAScout.org to begin or search online for Boy Scouts of America and land on either the National BSA site or the local Council site www.AlamoAreaBSA.org then click on “JOIN SCOUTING“. Detailed information on Scouting programs follow, with the ability to enter a zip code to find available units on a map to join. Who is able to register online with the Boy Scouts of America, Alamo Area Council?First time youth and adult members who have never been a part of the Boy Scouts of America, Alamo Area Council are able to register online. Does the paper membership application process go away? No. Paper applications are still available. What if I don’t know if my Key 3 are registered properly?Please contact the Council Office and request an updated roster. Will this online process be available for recharters and membership renewals in the near future?It is the intent of this BETA test if found successful, to offer this platform for recharters and other purposes to simplify the application process. Until then, processing of recharters, merit badge counselors, etc., will stay the same. Can I use my mobile device with Online Registration?Yes. What payment methods are accepted to renew an individual’s membership online?Credit and debit cards are accepted. Check, ACH, Cash, and Financial Aid require use of paper registration forms. What are the benefits of online membership registration for new parents and Scouting youth?It’s green. It’s fast, easy and convenient. It provides accurate spelling and contact information. No signatures are required. What are the benefits of online membership registration for unit leaders?No collecting forms. No depositing money at the bank. No completing registration paperwork. No waiting to know who’s registered. No running around for signatures. Is a parent/guardian signature required for online membership registration?No. The parent/guardian’s online payment of a Boy Scout membership replaces the need for a signature. What happens if a youth wants to transfer their new unit membership registration to another Unit?Transfers are made offline by Council staff. Is online membership registration available in Spanish? No. Paper forms must be used to register in Spanish.